Last edited by phoenixkonsole on Fri Jan 06, 2012 4:40 pm, edited 1 time in total. The ARM Version will be released as first. I will be on vacation so end of August could be doable. The first release will not include Hollywood. after seeing the demo I can't wait to try this on an Efika MX. going to try it out on virtualbox for sure. I am actually now working 100% on the Efika version. In a "few" minutes i will upload my first public "AROS hosted distribution" . it will run on every armel linux. Final AEROS should/will be armhf. Whatever in the meanwhile i will show (tomorrow or maybe later today) a short video of launching Linux apps from inside AROS on Efika. I just wan't to get rid of Ubuntus wm. Ha... I should give a short update about the idea behind AEROS. Linux brings the benefit of having a large or let's say gigantic amount of user/developers and applications. AROS is much more efficient than LINUX. A linux user will like how snappy he can browse through the filesystem compared to for example Ubuntu. This is also the case if you will try the coming preview (milestone 0 : D ) on Ubuntu on your EFIKA MX.. compare the speed. Actually the ARM line of AROS has been ignored a bit.. i hope this changes and you can enjoy a lot of fast and efficient (because of low footprint) apps besides your well known Linux apps. 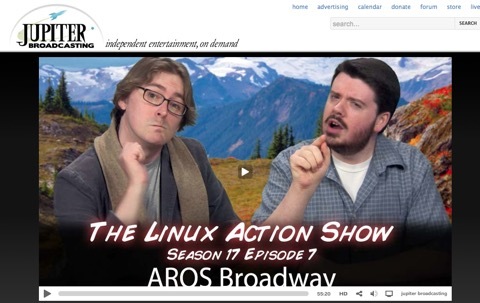 One note: AREOS will not just a package of AROS hosted (like the one i am now uploading) but a full Linux distribution. Most stuff like running AROS in Fullscreen and having Linux-windows on top with seamless (not mouse stuck in window effect)mouse movement is not possible on Ubuntu. Last edited by phoenixkonsole on Fri Jan 06, 2012 4:38 pm, edited 1 time in total. Ahh.. i forgot the manual! After decompessing the archive you can find a folder called "boot". Go there and click on AROSBootstrap to "boot" AROS. I would really like to test this on my Efika MX but after extracting thr folder on the desktop and clicking the AROSBootstrap icon, nothing happens, I only get an error something. Is there any other AROS I can try to run on Efika MX? If so, can I boot it from an SD card and if so, how would I mount the iso to the usb? If I would use UniversalUSBInstaller.. what OS should I choose from the menu, so I can "see" and choose the iso from my desktop/the place where I have it? are you using the standard ubuntu on your efika? Or the debian thing with 3d support? It should work with ubuntu, but it isn't compatible (yet)with the ARMhf debian image. Normally you should just need to click on AROSBootstrap. You could try to run it from shell to get a bit more feedback. there is no iso /img yet avaible. You just need to extract the files. Maybe i had more free ram than you. Last edited by phoenixkonsole on Sat Jan 14, 2012 11:20 am, edited 1 time in total. Hi Pascal, I am using the pre-installed Linux Maverick 10.10 so I guess it should work? Please let me know how to make this work. See my "edited" last post. I assume that you have not enough free RAM. I am running a newer version of ubuntu. I had to install it because i ran into a bug which was present in "my old" preinstalled ubuntu. I will prepare a image based on Ubuntu. Lx-command is still not running right on ARM and AROS hosted needs a small fix in order to get an id for Openbox Windowmanager.. that's needed. Michal is working on a AROS hosted port to ARMhf which will give beter performance and 3D support. This is Efika MX Smartbook btw, but it should not make a difference right? When clicking the AROSBootstrap, I get an error that there is no software that can run the executable?! from the shell.. nothing happens. Oh well.. maybe this is over my head and should just wait for an img file instead? This is strange!? I will ask Michal to test this on an Smartbook. EfikaMX progress and a public download will be made available here in this thread. Ok, will follow this thread for the updates then, thank you.